Your thyroid is a butterfly-shaped gland in your neck. If you’ve ever watched your weight, chances are you’ve thought about your metabolism more than a few times. Your thyroid regulates metabolism, or how quickly your body breaks down food for energy. Several factors influence how quickly your thyroid works, including messages from the pituitary gland in your brain. By being able to identify signs of when your thyroid is working -- and when it isn’t -- you can maintain your metabolism function. Your thyroid is located in your neck, just in front of your windpipe and has a butterfly shape with each “wing” on either side of your windpipe. The mineral iodine acts as fuel for your thyroid, and the thyroid combines iodine with its chief hormones T3 and T4 to stimulate your cells. These hormones enter your cells and stimulate your body to use fat and carbohydrates for energy, a process known as metabolism. While your metabolism is very important, your thyroid performs other functions as well, including influencing growth and development to help the brain mature. One method of measuring the speed of your metabolism is by figuring out your basal metabolic rate. This is a measurement of how much oxygen your body uses over a certain amount of time while you are at rest. When your body uses more oxygen, it also heats up and you need more energy, or calories, to function, according to Colorado State University. If you have a low BMR, your thyroid is likely working more slowly than it should. This condition is known as hypothyroidism. If you have a high BMR, your thyroid may be overactive or burning through calories and oxygen a little too well, a condition known as hyperthyroidism. While your thyroid plays a role in metabolism, it’s not the only factor in weight maintenance, loss or gain. Weight is a matter of how much food you eat, how active you are and how other chemicals and hormones in your body affect your weight, according to the American Thyroid Association. If you have hyperthyroidism, you may lose weight because your body burns through calories faster. However, hyperthyroidism also may increase your appetite, which can offset weight loss. On the flip side, hypothyroidism can cause weight gain -- typically about 5 to 10 pounds, according to the ATA. This is most commonly the result of water retention due to the thyroid hormone’s effects. If you suspect your thyroid may not be working up to par, your physician can perform a blood test to determine your hormone levels. A slow or fast metabolism is not the only symptom associated with hyperthyroidism or hypothyroidism. For example, hypothyroidism causes fatigue, difficulty tolerating cold weather, hair loss and muscle weakness, according to Colorado State University. Hyperthyroidism can cause unexplained nervousness, insomnia, a higher-than-normal heart rate and anxiety. Both conditions can be treated with medications, including artificial hormones. How Many Ounces of Water Should One Drink Every Day? What Are the Dangers of Low Caloric Intake? Can Too Much Broccoli Affect Your Thyroid? 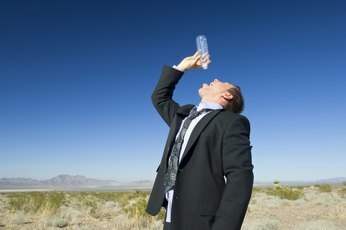 Can a Dry Throat Be a Sign of Diabetes? 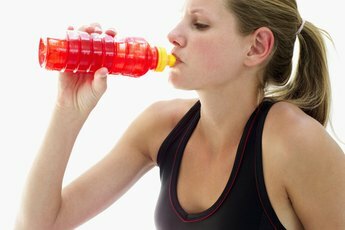 What Is Good to Replenish Electrolytes?